Mission: To educate the general public of the substantial social and economic costs to problem gamblers and society in general caused by VLTs (Video Lottery Terminals) and to work towards the elimination of VLTs currently operating in the province of Nova Scotia. https://gamingns.ca/: The Nova Scotia Gaming Corporation (NSGC) is responsible for the business of gaming in Nova Scotia. It is a Crown corporation governed by the provincial Gaming Control Act, and is charged with leading an economically sustainable and socially responsible gaming industry for the benefit of Nova Scotia’s and their communities. https://novascotia.ca/dhw/gans/: Gambling Awareness Nova Scotia (formerly the Nova Scotia Gaming Foundation) was a not-for-profit, arms-length government organization that encouraged and supported an independent response to gambling harm in Nova Scotia. 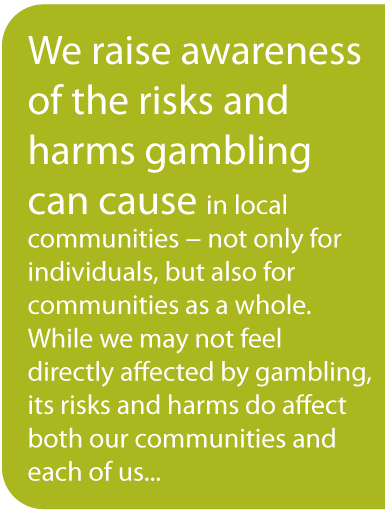 Gambling Awareness Nova Scotia (GANS) sometimes provides funding to community groups and researchers to help address and raise awareness of gambling harm. The organization has been eviscerated by successive provincial governments and is no longer capable of achieving the stated mission. http://www.problemgambling.ca/EN/AboutUs/Pages/default.aspx: The Problem Gambling Institute of Ontario at the Centre for Addiction and Mental Health brings treatment professionals and leading researchers together with experts in communicating and sharing knowledge. Our focus is on collaboratively developing, modelling and sharing evidence-based solutions to gambling related problems, within Ontario and around the world. http://www.opgh.on.ca/: The Ontario Problem Gambling Helpline (OPGH), which opened in the fall of 1997, is an information and referral service available to members of the public, including problem gamblers, family/friends of problem gamblers, and service providers working with clients experiencing problems related to gambling. The Problem Gambling Institute of Ontario (PGIO) at the Centre for Addiction and Mental Health (C​​​AMH) brings treatment professionals and leading researchers together with experts in communicating and sharing knowledge. Our focus is on collaboratively developing, modelling and sharing evidence-informed solutions to gambling- and technology-related problems within Ontario and around the world. http://www.youthgambling.com/: The Centre is committed to the advancement of knowledge in the area of youth gambling participation and risk-taking behaviors, through the development of both basic and applied research. Members of the Centre and of our International Advisory Board are engaged in a multitude of research projects that directly address youth gambling problems and that of co-occurring disorders. As part of our broader mandate to understand youth gambling, the Centre is also engaged in training, treatment, prevention, information dissemination, and policy development. http://www.abgamblinginstitute.ca/: The Alberta Gambling Research Institute is a consortium of the University of Alberta, University of Calgary, and the University of Lethbridge. Its primary purpose is to support and promote gambling research in the Province of Alberta. http://www.bclc.com/: For more than 25 years, we’ve entertained customers with a chance to dream and have fun, while delivering revenue to the Government of B.C. for the benefit of British Columbians. During this time, we’ve evolved from a lottery corporation to a full-spectrum gambling entertainment company responsible for conducting, managing and operating lottery, casino, community gaming and eGaming in B.C. https://yginternational.wordpress.com/: This blog highlights news based on the McGill University’s International Centre for Youth Gambling Problems and High Risk Behaviors. http://www.sfcghub.com/: recognize that there are many different paths to recovery, whether it be through Gamblers Anonymous or another path. You are welcome to share your recovery experience with us, but ask that you also respect other individuals’ recovery journeys as well. http://stoppredatorygambling.org/: Our mission is to put the failed government policy of predatory gambling on the national agenda. No issue better represents what ails our economy and our democracy but most of all, how we can fix it. We are the most diverse movement in the nation, an affirmation that most Americans share basic core principles and values regardless of their position along the political spectrum. http://www.wannabet.org/: Online magazine for teens, which includes games, personal accounts and quizzes about gambling and gambling related issues. http://rehab-international.org/gambling-addiction/internet: Rehab International is dedicated to helping individuals and their families who are living with addiction find the most appropriate treatment available to meet their needs. www.gamblersanonymous.org.au: Gamblers Anonymous is a fellowship of men and women who share their experience, strength and hope with each other that they may solve their common problem and help others to recover from a gambling problem. www.gamblock.com: Blocks access to internet gambling sites. Helps people with gambling problems avoid the dangers of on line gambling. http://www.gamblersanonymous.org/index.html: we are self-supporting through our own contributions. Gamblers Anonymous is not allied with any sect, denomination, politics, organization or institution; does not wish to engage in any controversy; neither endorses nor opposes any cause. Our primary purpose is to stop gambling and to help other compulsive gamblers do the same. http://www.gamtalk.org/: GamTalk is an online community for people with gambling issues to share their experiences and ideas. Whether you have a gambling problem, know someone who does, have stopped gambling completely, or just want to get ideas on playing safely, GamTalk can help.